LCD screens use liquid crystals, which have a high degree of order, even though they form a fluid. A new theory detailed in Physical Review X maps out the interplay between order, temperature and symmetry. Chances are that you're staring at a collection of liquid crystals right now. Most screens nowadays are LCDs, meaning that they have a number of liquid crystals in every pixel. The computer determines whether each pixel blocks light or lets it pass by sending small currents through the liquid crystals. That way, the correct color filters give the pixel the appropriate color. LCD technology needs a certain amount of order. 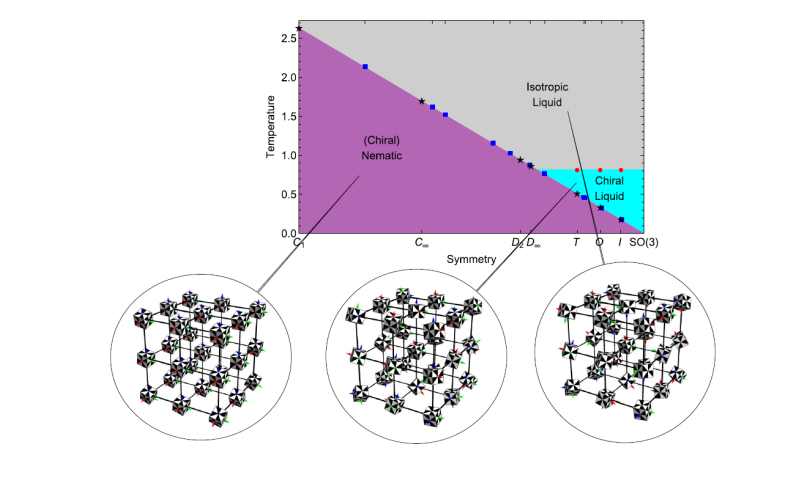 If the screen gets too hot, the liquid crystals will convert into a useless, chaotic, ordinary fluid. At room temperature, they also form a fluid, but they have the necessary degree of orientation order. Leiden theoretical physicist Prof. Jan Zaanen and his group now formulated a theory on the interplay between symmetry, order and temperature. The more symmetric a liquid crystal is, the colder it needs to be to contain sufficient order. After all, it is harder to notice a crooked part in a composition with symmetry in many directions. In the figure, we see the ordered state on the left—displayed in purple in the graph. With low symmetry (left in graph) it abides even at high temperatures, but with high symmetry (right in graph) this takes extreme cold.